The Aztecs believed in a number of Sun Gods, some of them belonged to a part of their creation myth beliefs and one of them was believed to be present in the days of the Aztec Empire. This “current” Sun God was called Tonatiuh and he was a god who had jumped into the fire to gain immortality. His name meant “Movement of the Sun”. The Aztecs believed that the Sun God could not move alone and needed a human sacrifice every year as a tribute, and the might of Sun warrior, to continue it’s movement. In the Aztec creation myth, there had been five ages and each of these ages had a Sun God of its own. Four of these ages had ended, in disaster, because of the feud over the position of the Sun God. The Aztecs believed that they lived in the fifth age, under the fifth Sun God called Nanauatzin. The Aztec creation myth states that at the end of the fourth age, the gods convened to choose a Sun God. The condition was that the chosen god would have to be consummated in the flames of fire to ascend as the Sun God. Tecuciztecatl, the handsomest of all gods, tried but couldn’t muster the courage to jump into the fire. Nanauatzin, an old god, walked into fire and became the Sun God. In some variations of the myth, the fifth and current sun is Huitzilopochtli, otherwise identified as the warrior of the Sun. The name of this Sun God means “smoking mirror”. He was the first god who became a Sun but was knocked down with a club by another god called Quetzalcoatl. In revenge, Tezcatlipoca became a jaguar and destroyed the world. Quetzalcoatl became the Sun God after knocking down Tezcatlipoca. His name means “feathered serpent” and he was the Sun God in the second era of Aztec mythology. The paw of the jaguar, Tezcatlipoca, brought down Quetzalcoatl. Tlaloc was chosen the next Sun God by the gods but Tezcatlipoca stole his wife so that he spent a long time in grief and when people asked for rain, he rained down fire and burned the whole world. Chalchiutlicue was the only goddess among the list of Aztec Sun Gods. Her name means “lady of the jade skirts”. She was the new wife of Tlaloc and very kind. But Tezcatlipoca slandered her kindness and hurt her, she wept and created a huge flood that swept across and destroyed the Earth. After Chalcthiuhtlicue’s age, the gods decided to choose a Sun God who would sacrifice his life by leaping into a huge fire. An old god Nanauatzin, sick with boils on his skin, made the leap and was consummated by flames and became the fifth Sun God. 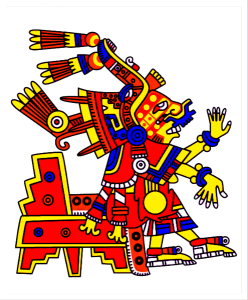 Main Aztec Sun God- Tonatiuh – After Chalcthiuhtlicue’s age, the gods decided to choose a Sun God who would sacrifice his life by leaping into a huge fire. An old god Nanauatzin, sick with boils on his skin, made the leap and was consummated by flames and became the fifth Sun God. Who was the real Aztec Sun God? There are multiple versions of the Aztec creation myth, in which different accounts of the Sun God are provided. What remains consistent is that through every age in Aztec mythology, there is a different Sun God. The current era is the fifth age according to the mythology and the Sun God of the present age is Nanauatzin, also called Tonatuih. Why were there different Aztec Sun Gods? The Aztecs believed that every age, or cosmic era, had a different Sun God. In Aztec mythology, four eras have already gone by, each of them with a Sun God of its own. Each of these eras, according to mythology, had ended in disaster. So in every new era, the gods chose a new Sun God who may prove to be better than the last one. Thus the Aztec believed that they lived in the fifth era and the fifth Sun God shone down on them. In the Aztec pantheon, Huitzilopochtli is the warrior of the Sun. According to Aztec mythology, the Sun can’t move on its own, and so it needs human sacrifices and requires warriors to fight for it to keep it moving. Huitzilocpohtli, then, is the warrior who fights for the sun and because of those fights, the Sun keeps moving. This is why he is also identified as the Sun God himself in some versions of Aztec mythology. His name means “hummingbird of the south” and he is often identified as the god of war in Aztec mythology. 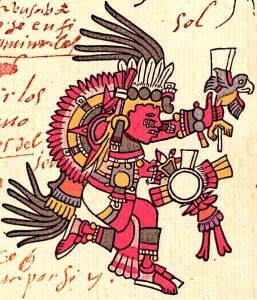 The Sun God Huitzilocpohtil, in Aztec mythology, was thought to battle with the stars and moon every night and come out victorious each morning. To help him in his battle, human sacrifices were given in his name and at his temple as a tribute. Tezcatlipoca, who was the first Sun God, was considered to be the most powerful god and the one concerned with bringing ruin, destruction and death upon humans. He was considered an invisible god. The Aztecs believed that at end of the reign of the fifth Sun God, the Earth would be destroyed by earthquakes. The Aztecs believed that the Sun God waged a battle against moons and the stars and other spirits. It was by winning this battle that the Sun came up every morning. It was believed that the Sun God needed the souls and blood of humans to win these battles, so humans were sacrificed every year for the Sun God. The Son Gods Quetzalcoatl and Tezcatlipoca were believed to have created the world by ripping the monster Cipactli into pieces. It was also believed that human blood was the price being paid to ameliorate the spirit of the monster. The most able and handsome people were chosen for sacrifice. The sacrifice itself comprised of the ripping out of the tribute’s heart, which the Aztecs believed to be the home of the soul and a part of the Sun’s energy. The body of the tribute was thrown down the steps of the pyramid in a trail of blood, which was considered the path to Sun. The Sun God had a key role in the Aztec pantheon and creation mythology. Of the many creation myths believed by the Aztecs, one centred solely on the Sun Gods. According to this myth, the creation of the Earth and its inhabitants have happened five times in five eras of five different Sun Gods. Each of the first four eras had ended in disaster and destruction of the Earth. Each subsequent era had a new Sun God. The Aztecs believed that they lived in the fifth era under the fifth Sun God called Nanauatzin. In some versions, this Sun God was protected by the Sun warrior Huitzilopochtli.